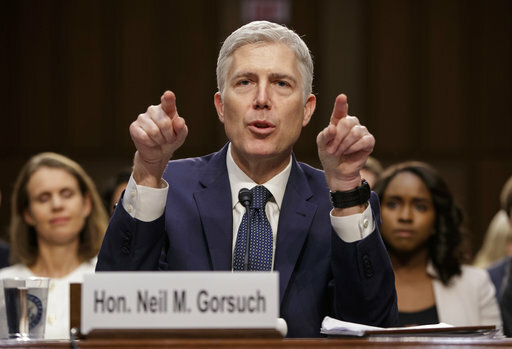 WASHINGTON (CN) – Wrapping up a nearly week-long hearing before the Senate Judiciary Committee, Supreme Court nominee Neil Gorsuch moved one step closer Thursday to what is expected to be a bitter fight before the full Senate. Thursday’s round of the marathon hearing added little to the 20 hours of testimony Gorsuch gave across the two previous days. Featuring 12 witnesses supporting the 10th Circuit judge and 12 opposing him, the day gave Democrats the chance to land final blows against the nominee before votes begins on April 3. The biggest bruise came from the father of an autistic child who soundly criticized Gorsuch’s holding that states have to provide only a bare-minimum standard of education to children with disabilities. Jeff Perkins said Gorsuch’s decision represented a “radically restricted” view of the law and prevented his son from receiving a quality education. Just a day earlier, the U.S. Supreme Court soundly rejected Gorsuch’s decision in that case — welcome timing for Democrats who have been trying to build the case Gorsuch consistently rules against disadvantaged people and in favor of corporations. But the biggest development of the day came across the street from the hearing room, where Senate Minority Leader Chuck Schumer announced his intent to join a Democratic filibuster against President Donald Trump’s choice to fill a seat on the Supreme Court still vacant over a year after the death of Justice Antonin Scalia. The filibuster threat is not new, as Democrats began to threaten holding up the nominee even before Trump announced Gorsuch at the end of January. But as grassroots calls for Democrats to vote against Gorsuch grew louder, the idea has become more concrete. Still, the planned filibuster is likely a nonstarter, as Republicans can change Senate rules with a simple majority vote to prevent Democrats from holding up the nomination. That change would exempt Supreme Court nominees from a procedural vote known as cloture, which ends debate on a subject and requires 60 votes to pass. That was the route Democrats took during the previous administration as Republicans held up President Barack Obama’s nominees to some executive positions. Senate Majority Leader Mitch McConnell began setting the stage for this at a press conference on Tuesday. ”If Judge Gorsuch can’t achieve 60 votes in the Senate, could any judge appointed by a Republican president be approved with 60 or more votes in the Senate?” the Kentucky Republican had asked reporters. If Republicans are intent on putting Gorsuch on the bench at all costs, the only way to avoid invoking what is known as the nuclear option would be to convince eight Democrats to vote in favor of the procedural move. Sens. Bob Casey, D-Pa., and Bernie Sanders, I-Vt. also announced their intent to join Schumer in opposing Gorsuch. Schumer pleaded with McConnell to avoid taking the dramatic step in his floor speech on Thursday. Republicans are still holding out hope they will be able to win enough Democratic support to avoid invoking the nuclear option, especially considering Democrats were largely unable to land a solid hit against Gorsuch during his hearings this week. “It’s probably not the answer you want, but we’re assuming Gorsuch has done so well that that’s not going to be an issue,” Sen. Chuck Grassley, R-Iowa, told reporters Thursday. The Senate Judiciary Committee, which Grassley chairs, is planning to approve Gorsuch on April 3. Gorsuch would face a vote before the full Senate shortly thereafter.